• The Secret Tapes of the O.J. Case: The Untold Story encores Saturday, Oct. 3 at 8pm on A&E and Monday, Oct. 5 at 8pm on LMN. • O.J. Speaks: The Hidden Tapes encores Saturday, Oct. 3 at 10:02pm on A&E and Monday, Oct. 5 at 10pm on LMN. Featuring exclusive access to O.J.’s stunning deposition tapes and new interviews with folks in the know — including Dan Petrocelli, the corporate attorney who had never tried a murder case — O.J. Speaks: The Hidden Tapes gives viewers insider access to elements of the case that courtroom cameras couldn’t capture. Watching Petrocelli and his team catalog how they used the deposition to catch Simpson in a stunning multitude of lies is especially compelling, as is watching victim Ron Goldman’s family members recount the roller coaster emotions of enduring a second trial. Through Simpson’s own statements — including an audio recording he secretly made before the infamous Bronco chase — The Secret Tapes of the O.J. Case: The Untold Story exposes disturbing realities about Simpson’s mindset and behavior before, during and after the criminal trial. The special also features rarely seen interviews with key players on both sides of the case, including candid discussions with Robert Kardashian and Kris Kardashian Jenner. The Secret Tapes of the O.J. Case: The Untold Story encores Saturday, Oct. 3 at 8pm on A&E and Monday, Oct. 5 at 8pm on LMN. O.J. Speaks encores Saturday, Oct. 3 at 10:02pm on A&E and Monday, Oct. 5 at 10pm on LMN. If the criminal justice system says he did not do it, then we must accept it by suspention of our varrias logics and move on. Either he is not guilty or It is the team of prosecutors who failed to perform. Putting our prejudice a side, no one will know what happen that night accept two unfortunate brutally murdered individuals or unless oj knows and decides to talk. He is soooooo guilty….He contradicted himself many times..in the deposition. 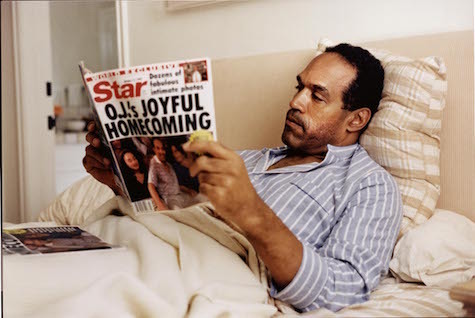 How could anyone think that he is Not Guilty..
……but that’s ok….we must pray for All who do wrong…..OJ needs help…..and God is the ONLY ONE who can give it to him……. O.J. is a classic sociopath!! I watched the criminal trial live and read Petrocelli’s book. This piece is as good a video view of the civil trial and people involved as Murchie’s “Seven Mysteries” or Gracian’s “Art of Worldly Wisdom” were written views of the world. It was good to see BOB (Butcher Of Brentwood) get at least a trifle of the comeuppance he so richly deserves. After the criminal trial Lady Justice lay bleeding under the pile of slime dumped on her by the “dream team”, but I’m glad to see she seems to have life yet in her. You have to give the defense this, though: it’s reasonably easy to get an innocent man off, but it takes hugely sly skill, even with a a marginally competent prosecution, a starstruck self-admiring judge, and a box of turnips for a jury, to free such a brutal liar in spite of the truth the evidence so clearly showed. After watching the Secret Tapes, I wish to share with the Goldman family this take on the perfect poetic justice for O.J. Simpson in his civil trial: IF THE SHOES FIT, YOU MUST CONVICT! I cannot believe this man is still playing the victim in all this! We will never know what really happened that night but he does – and he is not telling!